My name is Krystal Mason. I am originally from New Zealand, but I am now also a proud Canadian citizen. Growing up, I spent every waking hour pursuing my first passion, competitive horse riding, showjumping, in particular. Now that I am settled in Canada, I have found a new hobby to be passionate about...showing Miniature Schnauzers! Maiha Miniature Schnauzers is situated approximately 45 minutes south of Ottawa in the vibrant Victorian village of Merrickville. We are a small home based hobby kennel with a goal to breed beautiful, sound, sane minis in accordance with the CKC breed standard. Our philosophy is family dog first, show dog second. The dogs are part of our everyday life, whether it be camping, canoeing, a day at the beach, or simply hanging out on the sofa watching T.V. But the thing we love to do most, is to be in the show ring. There is nothing more exciting than to be in a line up of beautiful dogs with your dog demanding the judges attention; "I am right here.... Pick me!" 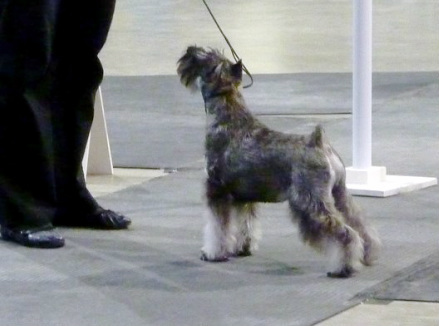 We are grateful to our friend and mentor, Kate McMillan of Minuteman Miniature Schnauzers, not only for her continuing support and guidance, but also for entrusting us with Sprite, MBISS AmGCh.Can.Ch Minuteman Safety Last CGN, who really could not have been a more perfect dog to begin our dog showing adventure.